The Rev. 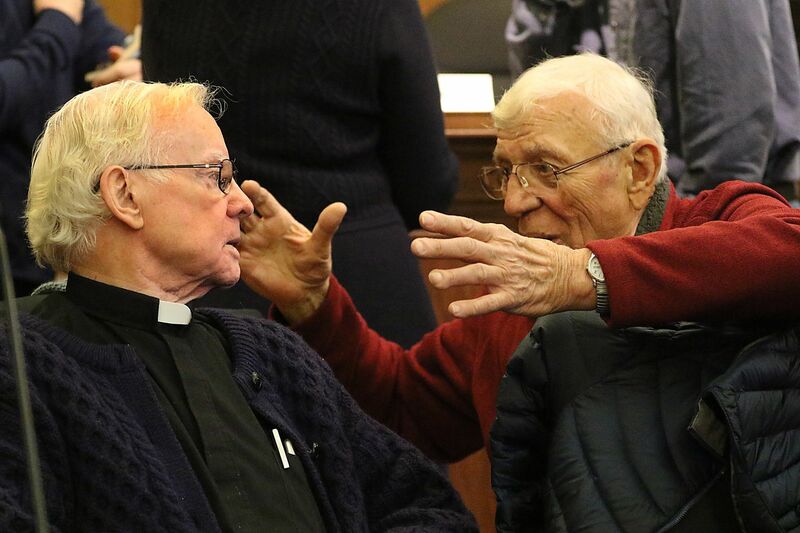 Michael Doyle (left) and Eugene Dixon, former members of the group of Vietnam war protesters known as the Camden 28, reunite Dec. 6 in a Camden courtroom. A public reunion of four members of the Camden 28, the peace activists who plotted to break in and destroy records at the city draft board office in 1971, offered a lively lesson about the turmoil that rocked the nation in the late 1960s and early 1970s. And while their faces were older and their hair shorter, their voices suggested the commitment for which they risked imprisonment a half-century ago has not diminished. “We have to stop wars, and we have to learn to solve problems without guns,” the Rev. Michael Doyle, 84, said during the event last week at 401 Market St. in downtown Camden — the same building the Camden 28 targeted in 1971, and in the same courtroom where they were tried in 1973. The movement they joined “was a call to peace and justice...and that larger movement is needed now more than ever," said Joan Reilly, 67, of Philadelphia. The three-month trial concluded with a jury declaring the defendants not guilty on May 20, 1973. After listening to Reilly, fellow activists Eugene Dixon and Keith Forsyth, and Doyle — his brogue as mellifluous as ever, despite cancer and other ailments he’s been fighting in recent years — I can understand why. Former Vietnam war protesters (left to right) the Rev. Michael Doyle, Joan Reilly, and Eugene Dixon listen to Superior Court Judge Joseph Rodriguez during a Dec. 6 event highlighting the headlines and the history made by the Camden 28. The four peace activists were joined by David Kairys and Carl Poplar, defense attorneys who handled the case; filmmaker Anthony Giacchino, whose 2007 documentary, The Camden 28, was broadcast nationally on PBS; and Senior US District Court Judge Joseph Rodriguez, who spoke about the riots that engulfed Camden days before the break-in at the courthouse. "Think times are troubling now? You have no idea what it was like to live through those days, " said U.S. District Judge Robert B. Kugler. The event was a reminder of how antagonistic the political left and right became 50 years ago, largely over the Vietnam War, and how rapidly public support for the war eroded in the 18 months between the break-in and the trial. Increasing numbers of Americans came to see the war as “flat-out wrong,” said Kairys. The Camden 28 story “is relevant today because there’s so much activism,” said Haddon Heights High School junior Alex Sulock, 17. “I could have been in the exact same position of the people who were being drafted and protesting,” said Moses Scott-Ali, an 18 year-old Heights senior. Listening to the judges, the lawyers, and the former defendants was a powerful experience for me as well. The soldiers fighting and dying in Vietnam “were the sons of fathers and mothers in the poor cities of the United States, and I knew that," Doyle said. "They were the sons of poor, powerless American people. “That war was a mistake,” he said. "It was a slaughter. It was outrageous.